The singing of the Twelve Days of Christmas is appropriate for all particularly during the Christmas period. (unless students can’t participate because of religious reasons) Singing is fun and an amazing way to dramatically improve language learning particularly for students who do not have English as their first language. Singing transforms studying into fun and can improve pronunciation. The Twelve days of Christmas lyrics provide a good source of vocabulary and the repetition helps with the retention of the vocabulary The music and words are included in the resource. 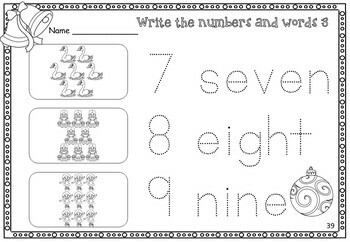 The other activities / worksheets are more suitable for use with younger students who are at the stage of counting to 12. The picture and word matching cards bring an additional opportunity to learn the names of the creatures / people/ objects used in the song. 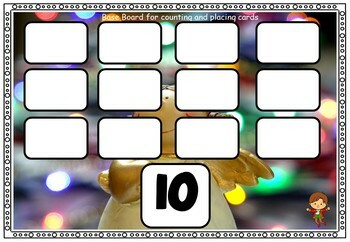 Activities include counting creatures / people/ objects and matching with numbers from 1 – 12. 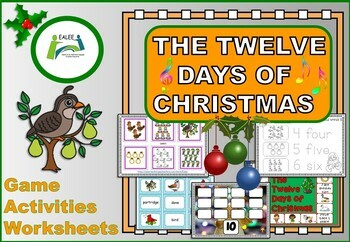 A workbook provides a chance to do some written work connected with The Twelve Days of Christmas. The preview comprises of the contents page and samples of what is included in the resource. Would you like to get TPT credit to use on future purchases in any store? If you would, please go to your 'My Purchases' page (you may need to login again). Beside each purchase you'll see a Provide Feedback button which you should click. This will take you to a page where you can give a rating and leave a short comment about the product. When you have left feedback on paid products, TpT automatically gives credit for use when you make other purchases in ANY TpT store. If you have just arrived at this one product and are not already in the EALEE store but would like to visit the store to see other products, just click on the word EALEE at the right hand side above the follow star. 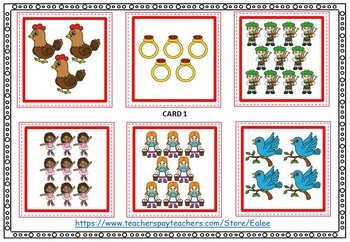 This will take you to the EALEE store where there are many other resources; some are free for you to download.